In this our latest article Shayn McCallum responds to Eric Aarons again on the theme of the Democratic Mixed Economy. Drawing from the insights of Karl Polanyi McCallum argues for a democratic mixed economy employing both markets and planning, but moving beyond 'the market society'. For McCallum economy must serve society and not vice versa. This includes environmental preservation. Honest and respectful debate always welcome!!! I appreciate the response that Eric Aarons recently made to my recent article on a democratic mixed economy. His critique raised a number of important points that I had been either entirely unable to address or at least unable to expand on in my paper which had been originally written as a contribution to discussions on economic policy within the Party of European Socialists, first being circulated within the French Socialist Party and German SPD. I also offered it within the UK Fabian society as a critique of Ed Miliband’s “Decent Capitalism”. Indeed, my main target in writing the original article, as much as to promote the idea of what I term (albeit imperfectly) a “democratic mixed economy” was to attack the use of the term “decent capitalism” which, I feel, is an unfortunate choice, linguistically and semiotically, that sets the parameters of the debate on economic policy at exactly the wrong point. This original article was somewhat truncated to meet maximum length requirements and, therefore, was only partially able to convey the theoretical position I am coming from. As I feel a more detailed explication of this background may serve to clarify the areas in which my approach and Eric’s both converge and diverge, I would like to take the time to more clearly set out my assumptions below. To begin with, I’d like to go over some of the areas where I feel Eric and I are closer than it may appear based on my original article and Eric’s subsequent response. Firstly; both Eric and I share an ecological emphasis. This may not be terribly clear from my original article but, in fact, we both appear to be agreed on the need to prioritise the issue of environmental destruction and, therefore, question any economic model based on untrammelled growth. I hinted at this very briefly in my original argument by including a few sentences rejecting the idea that there is much value in trying to reinvent manufacturing in the advanced capital-dominated societies. Also, like Eric, I am not overly challenged by the idea of a post-industrial society (although this involves problematic aspects which I will come to further on in this response). Furthermore, I would also tend to agree with Eric that econocentric arguments reducing socialism to questions of property forms are caught in an overly-limiting approach that is, at best, irrelevant and at worst, totally incapable of offering cogent responses to modern realities. Although, due to being an article focusing on economic issues, it may not have been clear; my intention was largely to attack econocentric thinking, which remains deeply imprinted in our collective consciousness. With all respect to the considerable genius of Karl Marx, the Left remains burdened with the legacy of “Marxism” which, I would argue, is merely the flip-side of neo-liberalism, in that both approaches are agreed on the centrality of economics. This is, ironically, part of the reason why neo-liberalism gained so much ground among social-democrats after the rise of Thatcher and Reagan in the 1980’s and the collapse of Soviet-style socialism in the last year of that decade. The either/or, Marxism vs. Liberalism discourse ultimately obscured what was always really going on within the advanced, capital-dominated societies. Although capitalism is a force that has, especially in recent years, established greater and greater dominance, I do not feel it is entirely accurate to simply refer to most modern economies or societies as “capitalist” as this obscures the complexity of what is actually occurring. Capital has had to struggle to establish and hold onto its hegemony over the course of its dominance. “Capitalism” (meaning the hegemony of capital) is a reality, but it is not as strong as either the Marxist approach, nor that of its neo-liberal mirror image, would have us believe. In fact, a brief look at the actual history of capitalism shows its hold to have been marked by constant precariousness and unending setbacks resulting from its many, obvious failures and the ways in which societies have organised to check and restrict its power. Failing to realise this, amounts to short-changing ourselves at exactly the moment when we have an opening to fundamentally change our way of life for the better. To clarify where I am coming from; I should explain that my own theoretical position is strongly rooted in the thought of the sovereign socialist thinker Karl Polanyi, whose nuanced critique of capitalism was equally critical of the economism of Marx’ approach. Karl Polanyi was a sovereign socialist of Hungarian origin who authored one of the most comprehensive critiques of capitalism produced from outside the Marxist tradition; The Great Transformation (which Eric clearly alludes to in the title of his response to my article). Indeed, Polanyi was seriously critical of Marx, in that, Marx’ own critique of capitalism was fundamentally econocentric. The eschatological historicism of Marx that predicted an inevitable collapse of the capitalist system and/or its overthrow by the socialist proletariat was based on one serious error; that the free-market capitalism described by the classical economists such as Smith and Ricardo represented the economy as it actually was (or would become in time as the last remnants of feudalism were expunged) rather than merely as an idealised, utopian model. In reality, capitalism, as envisaged by the classical economists, is an impossible system- a utopia (or dystopia) capable of functioning only on paper. This contention of Polanyi’s is borne out by the fact that, whenever there is an attempt to establish a self-regulating market system, collapse occurs soon after. Polanyi himself witnessed the Great Depression and we are currently witnessing the second proof of Polanyi’s theory as the rotten fruits of three decades of neo-liberalism are reaped over our heads. Liberal economists, of course, always counter from the opposite perspective; blaming government intervention or imperfect policies for inhibiting the growth of the “true” self-regulating market yet, quite honestly, whilst this ever-ready excuse that things went wrong because the capitalism involved was not “pure” capitalism should be given more credibility than the frustrated Marxist claim that the Soviet bloc collapsed because it was not “pure” socialism, is beyond me. The reality appears to be that there is always something blocking the “pure market economy” and always will be because such an economy, in reality, is utterly unworkable. Most people, not just the working-class, will want to oppose it or, at the very least, modify it to reduce its extremes. Thus the undying nature of the liberal dream paralleling that of the convinced Marxist; “our system would surely work if only people would stop getting in the way and diluting its purity”. We are faced with a hermetically-sealed, self-replicating logic as un-debatable as an item of religious faith. According to Polanyi however, society must be understood as an organic whole, of which the economy is but one embedded part. 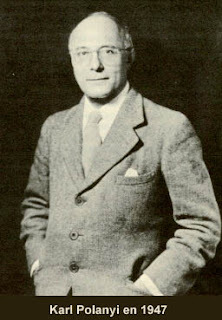 Unlike Marx who divided a society into its “base” and “superstructure”, Polanyi made the point that this econocentrism had only emerged with the industrial revolution and was part of the ideology of this revolution. For most of history, the economic question had been secondary and embedded within a broader network of culture, social expectations, legal arrangements and political systems. The specific feature of capitalism, as a rising force, was a conscious effort to extinguish pre-industrial and pre-capitalist modes of existence to impose “the rule of economics” over the whole society. Where under feudalism, with all its abuses, ordinary people enjoyed certain unspoken social rights, primarily the right to live by, if all else failed, hunting and gathering on common land, measures such as the famous enclosures act forced the poor to seek their means of sustenance by selling their labour on the market. The important feature of the rule of capital was its totalitarian nature- its quest to privatise common space in order to ensure total compliance with the market. Moreover, “the market” was no longer the simple merchant’s or trader’s market that had existed and evolved in most societies able to support more than a subsistence economy but rather a new system based on legal contracts in which virtually every form of commodity could be traded. As Eric points out in his response, financial markets and consumer markets are of a different nature yet “market economics” ignores this fact and treats all commodities as basically similar. Land, labour and capital may all be bought, sold or rented alongside consumer goods and professional services in a theoretical space of free and open mutual contracts entered into willingly by buyers and sellers. What the rising capitalist class intended to do was to make this system pervasive so that, rather than the multi-level feudal economy based on taxation/tribute and peasant subsistence with trade existing, however sophisticated, as a secondary pursuit by the urban bourgeoisie and peasant farmers producing enough to trade in surpluses, capitalism was a system seeking to enshrine trade and exchange as the central economic mechanism. The dream of capitalism, in other words, is not merely a “market economy” (to replace the multi-tiered economies of the pre-capitalist era) but, in effect, a “market society”. So far, none of this picture much contradicts Marx, however the important difference between Polanyian and Marxian narratives is that, unlike Marx who believed that the capitalist revolution had been successfully completed, or at least soon would be, Polanyi argued that the reality was somewhat more complex. People resisted the imposition of the economy on their lives creating, what Polanyi termed “a double movement” in which every attempt to advance capitalism was met by popular resistance, necessitating compromises and accommodations between the revolutionary capitalist class and the various counter-forces (which included, alongside the nascent urban proletariat, the peasantry, dispossessed feudal aristocracies, petit bourgeoisie and various other groups all presenting a range of, often contradictory and antagonistic, objections to market rule). Unlike Marx, who envisaged a revolutionary awakening in the urban proletariat as the dialectical antithesis of this capitalist rise, Polanyi saw a conservative resistance to a revolutionary capitalist class attempting to preserve, and later extend, rights which were being extinguished. Moreover, it was this initially conservative response that empowered the radical answer in socialism which Polanyi defined as “the tendency inherent in an industrial civilisation to transcend the self-regulating market by consciously subordinating it to a democratic society”. Marx had ambiguous feelings towards democracy. Towards the end of his life, he began to speculate that, in countries such as Britain at least, socialism might yet be introduced peacefully. For most of his life however, Marx saw parliamentary democracy, in particular, as little more than a bourgeois trick. Subsequent orthodox Marxists belittled and ridiculed notions such as “the parliamentary road to socialism” and the revisionist ideas of Bernstein that, in the end, despite the ongoing embarrassment they caused, came to roost in the practice, if not theory, of virtually the entire European socialist movement (including the Eurocommunist parties). Whilst Marxists disdained the political, seeing all politics under capitalism as bourgeois politics, the success of socialist parties- not necessarily in building (capital “s”)“Socialism” as conceived in its pure form, but in forcing back the power of capital, clearly show its effectiveness. This success is much under-estimated, I believe, due to the ideological blinkers imposed by orthodox Marxism. According to the Marxist “revolutionary” reading of social-democracy, reformism was a form of betrayal and the reformist working-class suffering from “false consciousness” however, for Polanyi, like Bernstein before him, this slow, incremental struggle in the field of politics was the natural form of the struggle for socialism itself in a democratic (or democratising society). Moreover, for Polanyi, this process of democratisation was, in itself, part of the socialist struggle per se. Looking at modern history through Polanyian eyes, everything suddenly makes sense. Whereas Marxists struggle to account for the lack of revolutionary fervour in the European working-class and liberals insist that capitalism and democracy are inseparable twins, a Polanyian reading of history sees democracy emerging and advancing largely against capital. This is particularly obvious in the neo-liberal era as democracy is being increasingly reduced to an empty ritual whilst “the market” is held up as an apolitical, “common sense” area not to be interfered with by meddling politicians or the unwashed plebeian masses with their “market distorting” trade unions, environmental organisations and other barriers to the sovereignty of business. In truth, “capitalism” has never managed to fully establish itself although it has acquired considerable ideological force, because, in the end, most people (including smaller capitalists) don’t want to live in the kind of dystopia capitalism actually implies. If “pure” capitalism were ever established, it would quite simply resemble hell for almost everyone (shades of which we can see in the U.S. or Greece, Spain, Portugal and Ireland among others)- a system with no security where every individual was seeking the maximisation of their own self-interest and the losers were simply “left to the wolves”. Modern “capitalism” as we live it is a compromise and always must be. The neo-liberals rankle against the necessity of this “market-distorting” compromise which has arisen as a result of subordinating the economy to society through the mechanism of democracy and have instead, attempted to create a conceptual universe based on “economic freedom” and have moved to enact policies, over the last 30 years, which entrench this mythology. “Freedom” in neo-liberal terms is the freedom to enter contracts, to buy and sell at liberty and to act in one’s own self-interest. It does not take a great deal of effort to expose the shoddiness of this conception of freedom which, for the majority does not even amount to meaningful economic freedom (for example; can the “right” to work for subsistence wages or starve be considered a genuinely free choice? Yet this is the essence of the neo-liberal approach to unemployment). The socialist answer to capitalism, has always been, in effect, to propose “freedom from economics”. Marx’ rare ruminations on communism envision a society where work is no longer mere “labour” but performed as an act of contribution to the society or self-fulfillment, for which each individual may expect the satisfaction of his/her material needs without the need for elaborate accounting. It is a beautiful vision and one worth dreaming about for the very distant future. For the forseeable future however, we may have to tolerate some degree of economic rule over our lives. Nonetheless, the goal of the Left must be to “put economics in its place”. The economy must serve humanity and not the other way around. In other words, rather than the empty ideal of “economic freedom” which presents a false definition of what it means to be free, the Left must continue to struggle for “freedom from economics”. Ironically however, to free ourselves from economics we must turn our attention more to economic issues. I would like to assure Eric that, perhaps contrary to the impression given in my previous article, I am not altogether dismissing questions of culture as political issues, yet, I must insist that these must not become the sole, or primary, focus of politics in the current period. Unfortunately, for the moment, economics truly is the “substance” of politics because the market has enslaved us. How can we doubt this for a second when the richest, most prosperous societies in the world are facing galloping poverty rates, massive unemployment and the wholesale destruction of social services? Moreover, this is all occurring in the middle of unprecedented material abundance. Throughout Greece and Spain the shelves of shopping centres and supermarkets groan with an abundance of goods even as the streets outside fill with the recently impoverished and unemployed who lack the economic means to consume what is available. Here we see the tyranny of economics and the waste and inefficiency of a market society. Production and distribution are misaligned. This does not imply that the only, or even preferred solution is a return to Soviet-style planning. The downfalls of this system have been enumerated at length for years. Nor is there much point asserting some utopian notion of “democratic planning”(not that it mighn’t be a good idea to experiment with this on a small scale) or some other exotic solution. People used to being able to determine their own consumption preferences in the marketplace are unlikely to want to replace this with a totally planned system no matter how democratic. Markets clearly have their place but what should that place be? What goods and services should be covered by the market and which should be provided as untraded “social goods”? These are important questions. Few people much mind having a variety of restaurants to go to or a choice of clothing styles or technological items but perhaps many of us do not feel a pressing need for a variety of power providers competing to sell us electricity or a host of private banking institutions that differ only to the extent that they are ripping us off. And there are other “empty” choices that would perhaps be more satisfactorily be taken over by well-run, transparent, public service providers (or perhaps a combination of public and third-sector non-profit providers if so desired) such as education, health, public utilities and welfare services. My reason for proposing a “democratic mixed economy” (and I should point out I am not “married” to the term but prefer it, for a number of reasons, to any of the alternatives on offer) is to allow for an open-ended experimental approach to reorganising the economy that puts people first, through the democratic, participatory mechanism and which is open-ended with regard to the question of the role and limitations of markets, the ownership and property mechanisms that exist and the degree of state, as opposed to private, cooperative or third-sector delivery of services. My own orientation within such a framework, would be strongly towards the socialist end of the continuum and the “mix” I would prefer would perhaps be leaning heavily towards the public/cooperative/mutualist approach but, in the end it would not be me but the majority which would (hopefully) have the final say on the composition of the mix (which would be bound to change over time anyway- probably in ways we cannot even foresee). Of course, as Eric pointed out, with regard to Australia but, in fact it is also largely true of all the advanced economies, we are no longer dealing with “industrial” but rather “post-industrial” economies in most of the wealthy nations. As I mentioned above, I do not feel the shift to a service economy is, in itself, a particularly terrible thing any more than it can be seen as intrinsically emancipatory. There is, however, an important element to this structural shift which presents a far more serious problem for the Left: the growing international division of labour effected by “globalisation”. It should be obvious to anyone that, no matter how abstracted from any kind of material production most of our jobs become, someone somewhere has to be growing the food we eat, buy, sell, market or advertise just as someone has to manufacture the clothes we wear, the vehicles we travel in and the computers we increasingly rely on in our service-sector jobs. The idea of a “virtual economy” is a risible fantasy that can only exist as long as we are prepared to ignore the fact that everything we really need to stay alive is physically produced somewhere. Indeed, the shift from a “production” to a “consumption” oriented society was one of the pillars of neo-liberal strategy. As Marx pointed out, when we view economic processes as consumers it is easy to ignore the injustices and exploitation that delivers us cheap goods, however, if we look at the same process through the eyes of producers, all of these miseries become clear. Not only did killing off industry in the wealthy countries have the effect of increasing unemployment (and therefore facilitating union-busting and assaults on wages in order to pursue the anti-inflationary policies that neo-liberals are so in love with) but also allowed large companies to deepen the international division of labour that is so beloved of free-trade theory, by relocating manufacturing to the cheap-labour havens of the “developing world”. Add to this the fact that there is no equivalent of the state at international level to govern or regulate these processes and it is quite clear that this whole process has had a great deal to do with a strategic flanking of the postwar social-democratic compromise. Governments renounced their competencies over economics “for the greater good” leaving no political response to market rule easily available. To a large extent, this explains the “deer caught in the headlamps” response of social-democrats to the current global economic crisis. The tools simply do not yet exist to do much about the problems we face. Where governance mechanisms are being instituted however, as can be seen at present in the European Union, they are not of a democratic nature but rather embody a technocratic response aimed at preserving the hegemony of capital, if not the self-regulating market nonsense that has had its dirty underwear exposed yet again. So, what to do? In this era, international coordination among Leftists is a matter of survival. This is something I have been actively struggling for in the Party of European Socialists. Socialists and social-democrats in Europe (which is my primary focus as I live on the margins of Europe in Istanbul, Turkey) need to work much more unitedly to present structural reforms at the European level that would enable greater democratic participation and transparency as well as advance a Europe-wide “social Europe” agenda. This is not an easy proposition as the European institutions are weighed down with layers of treaties, bureaucratic and technocratic measures and entrenched ideologies that are firmly opposed to reform. The European Union was specifically conceived of as a “benign technocracy” rather than a democracy as its architects feared (probably correctly) that European public opinion would be hostile to integration- let alone political union. The need to reform Europe is only one, fairly limited, step in the struggle to reform globalisation. I, personally, do not consider globalisation as an intrinsically negative phenomenon and certainly see no future in any attempt to go backwards to re-entrench the Westphalian state or try to reindustrialise the rich world economies. Our problems today truly are global yet we lack global political mechanisms to deal with these. Ultimately, these struggles to oppose and limit the power of capital must become international and, moreover, they must be democratic if they are to succeed in any worthwhile way. Finally, I’d like to address one of the most pressing issues raised by Eric in his critique of my previous article; environmental destruction. This is perhaps one of the most important indications of our need to adopt a global approach as the environmental disaster posed by climate change is not limited in its effects to any one country or region but rather, poses significant risks for all life on earth. The ideology of untrammelled growth central to capitalism is profoundly dysfunctional. The only analogue in nature to an organism that recognises no limits or controls to growth is cancer. As we all know, the point at which untreated cancer cells cease growing is at the point where the host body dies. It is an ugly analogy but, the economic system we currently follow is essentially cancerous. Schumpeter’s “creative destruction” increasingly looks more like simple destruction without any “creation” worth mentioning. It is necessary that, lacking a global political mechanism able to coordinate such efforts, individual nations do what they can to respond to the environmental crisis but, we must acknowledge that, just as individual responses to the related economic crisis are limited, so too will our very best efforts to address the environmental crisis be. This is, however, no reason for refraining from the attempt. What can be done must be done and struggle is the best way to perceive the limits to what can be achieved and the only way to force up past those limits. The task for Leftists in the current era is, I would argue, to advance international cooperation and solidarity among ourselves whilst reaching out to our allies. The movements for change of the future are liable to be networks and loose coalitions cooperating around specific issues rather than the mass parties of the past. We need to leave our ideological conceits, sectarian preferences and vanguardist fantasies buried in the Twentieth Century where they belong. Our goal must, I believe, be to advance new forms of participatory democracy at the local, national and international level and, a major programmatic focus must be economic. If we are to ever be “free from economics” we must attack economism by offering alternative economic models that subordinate the economy to society and democratic politics. As much as possible, we need to experiment with practical models rather than attempting to push dry theory which does little more than keep academics in jobs. People are understandibly skeptical of almost any new idea until they can see for themselves that it works. The wasteland of failed ideas lurks behind us all and provokes us all to caution and conservatism; the Left needs to work with this cautiousness rather than trying to browbeat people with our “superior understanding”- an unfortunate personality flaw which has left us stereotyped as “out-of-touch, self-righteous elites” by the cunning conservative populists of the Right. There is no question that the task is daunting and the stakes are extremely high but the global crisis of capitalism is right on top of us, threatening everything we hold sacred and even everything that keeps us alive. There is a golden opportunity presenting itself, for perhaps the briefest of times, to change direction and lay the foundations for a quantum shift in the way we live on this fragile planet of ours, how we treat each other and how we view ourselves and our societies. The possibility to really change for the best is tantalisingly tangible yet frustratingly held back by our own limitations and the lack of structures to work through. I admit that my own answers remain vague and more a matter of principle than detail but these things are always a collective effort. Already there are countless examples of activists doing what needs to be done and trying to implement change on the ground, perhaps what we need is just to deepen our links with each other and see what can be gleaned from our common experience as we try to forge disparate acts of resistance and creation into a broader strategy for change. The nature of the times demand that we stretch the limits of our creativity in responding to the needs of our era. In contrast, it is in just such times as these that the last thing we need is a “Left” that has nothing more to offer than a bleating plea for “decent capitalism” based on a return to some sanitised, nostalgic fantasy of the industrial past. Such an appallingly stunted vision is worse than no vision at all, and it is in this spirit that I was originally moved to make my previous contribution to the economics debate within the European social-democratic movement. I hope this goes some way towards clarifying the perspective from which I approached my previous contribution on the “democratic mixed economy”. I believe there are several points on which my own views and Eric’s converge or, at least overlap though several points of contention may yet remain, which I believe is a strength rather than a weakness as it is only through discussion that ideas can be refined. I would be more than happy to discuss these ideas further with Eric or anyone else who is interested. The most important thing is to discuss and develop the concepts and approaches that can take us forward and my own views are nothing but a work in progress- I am always open to the persuasion of better ideas and more insightful perspectives. In other words, all (constructive) responses are welcome. The point being that Bernstein considered himself a Marxist even while he was revising central tenets of the Marxist orthodoxy. Bernstein refuted class bifurcation, necessary capitalist collapse and dialectical materialism - But he kept an awful lot from the Marxist framework as well. Theorising the falling rate of profit and intensifying rates of exploitation is also still important to provide a framework of understanding where people can conceive of the forces driving a falling wage share of the economy - as well as a declining social wage and increasing corporate welfare - and use that framework to develop practical responses. Overproduction is still a particularly useful Marxist concept as it points to its own amelioration through strategic public and 'natural' monopolies - as ways of containing waste and cost structures. Shayn,you also criticise the Marxist category 'false consciousness'. I personally think Marxism's category of false consciousness is more complex than often recognised. Marxism suggested 'false consciousness', 'trade union consciousness', 'class consciousness' and 'social democratic consciousness'. One could have a degree of class consciousness, for instance, and not have developed a true 'social democratic consciousness'. Thanks for the comments Tristan. You're quite right, Bernstein struggled with his "heresy" all his life and considered himself a sincere "scientific socialist" close to the spirit of Marx. I actually have no more argument with Marx than I do with Einstein. Just as in physics, no one feels obliged to be an "Einsteinian" we should be able to acknowledge the massive intellectual debt we all owe to Marx without trapping ourselves under the weight of the "Marxist" faith (such as it more-or-less became). I am arguing heavily for the adoption of Polanyi's insights yet I have no desire to institute "Polanyianism" as a new doctrine to supplant Marxism. In this sense, I'd say Marx' greatest contribution to socialism was his "scientific" approach and there's no reason to cast him off for merely getting a few things wrong. He never claimed to be a prophet, it's a pity so many of his (dwindling) followers seem to practically see him as one. Regarding "false consciousness", consciousness is a huge and under-explored area. Marx really just opened a field that later scholarship, especially after Gramsci, has delved into much more deeply (yet still not deeply enough). That people can be manipulated into supporting programs that go against their material interests is quite obvious but what I was criticising was more the view that working-class reformism is a product of "false consciousness". The Marxian (and especially Leninist) view that revolution was held at bay by the "trade-union consciousness" of the labour aristocracy, though not entirely untrue, is, I believe, overly simplistic. I would argue that these analyses, being excessively economistic, fundamentally underestimated the value and transformationary potential of ostensibly "bourgeois" politics. Consciousness certainly had much to do with limiting this transformational potential and the Marxism versus Liberalism dyad, I would argue, contributed to a kind of conceptual prison that ultimately blinded democratic socialists to their own potential power. This is, of course, a whole other discussion- in fact, it's the basic thrust of my (in progress) PhD thesis so I'd be happy to discuss it further- perhaps in another article? Anyhow, thanks a lot for the comment. Eric Aarons is right - democratic mixed economy needs to be explained and you cannot just add adjectives to a concept in the hope that this creates something new. Shayn McCallum is right, you cannot prioritise values, culture and morals, as the drivers of inhumanity and injustice are based (but not contained) in a different sphere. Capitalism means the existence of capital as a form of surplus value. The needs of capital deform values, culture and morals. If people want to talk of democratic mixed economy, then they need to say the mixture is between planned, public and private, and the economy is socialism. Otherwise readers may think that both Shayn and Eric want to mix capitalism and socialism. Firstly I think 'democratic mixed economy' is very powerful as a slogan because it appeals to both radical and conservative instincts. Some look back to the years of Keynesian consensus/mixed economy and see this as a model for today. 'Democratic mixed economy' appeals to such people - but adds the radical content of economic democracy as well. By pursuing economic democracy - as a slogan - it appeals to radicals as well. As to the *substance* of a democratic mixed economy - I don't think we need to be overly-exclusive. We can conceive of a movement for a democratic mixed economy which is pluralist in nature - mobilising a broad range of elements on both the Left and the Centre-Left. As such the 'democratic mixed economy' can be conceived of as a historic compromise which accepts the inevitability - for the time being - of aspects of capitalism. But whatever we think of this the language of the 'democratic mixed economy' is still crucial - because it brings a broad range of people - including people who accept aspects of capitalist Ideology - into a dialogue about the preferability of economic democracy. ie: it can bring that debate into the mainstream. But the crucial point is conceiving of the 'movement for a democratic mixed economy' AS A MOVEMENT - not an exclusive model - and hence bringing a wide range of forces on the Left into dialogue on the basis of some very powerful and appealing concepts - which can capture peoples' imagination at this particular historical conjuncture. What follows then is a debate on the Left as to WHICH FORM of democratic mixed economy is preferable. But this assumes a consensus that some form of democratic mixed economy is preferable - and hence there is a baseline in favour of co-operative and mutualist forms, democratic collective capital formation, public ownership of various kinds etc. By establishing this as the baseline for debate which establish 'boundaries' favourable to the goal of economic democracy. As part of this debate we can legitimately put forward variants on the Democratic Mixed Economy that are very radical. Eg: the goal of democratic and/or social ownership of the commanding heights, while promoting co-operative small enterprises. My own belief is that we need to begin by re-establishing the desirability of co-operative and mutualist forms (involving producers, consumers, citizens), as well as the preferability of certain strategic natural public monopolies. (eg: energy, water, communications, transport) Alongside this I envisage the intervention of public enterprise (eg: in banking) to provide progressive cross-subsidies and counter collusive practices, while mobilising any profits to provide social programs. Other strategic targets for socialisation could include mining, oil etc. Beyond that there is the question what can and cannot be achieved in the context of international capitalism. We are dependent on the innovations of the multinationals. We are dependent on foreign trade. Attracting foreign investment can be to the benefit of workers. Sometimes co-determination will be a more realistic medium-term prospect than anything more radical. Autarky isn't the answer - etc. But the language of the "Democratic Mixed Economy" provides us with a weapon - a weapon with which to forge a dialogue on the broad Left around economic democracy - and the language which can inspire and mobilise people at this particular historic conjuncture. And because imaginably any future form of socialism will be mixed - with co-opervative, mutualist, social - forms of ownership; with instances of co-determination, democratic collective capital formation etc - It is a concept that can last the test of time - because it is applicable to such a wide array of economic models - on the basis of a common ground of diverse forms and economic democracy. Tristan, this is very well put and I agree absolutely. I think we need to reconceptualise the way in which capitalism and socialism actually compete on the actual terrain of real-world societies. I do envisage a democratic mixed economy as embodying the potential to evolve towards socialism (meaning a fully embedded, democratic economy) and away from a system dominated by the logic of capital (which is why it is reasonable to refer to today's societies as "capitalist" or "capital-dominated"). The very real and obvious fact however, is that simply advancing absolutist anti-capitalist slogans or platforms is not going to get the Left anywhere at this point in history. We have been outflanked in a historical counterrevolution against the democratic gains of the postwar era and we no longer have, for the time being, the tools to act against global capital. This does not mean admitting defeat- but it does mean picking our battles. Ideological purity and academic debate is not going to get us beyond capitalism but building a broad left that is globally networked and coordinated on a platform of asserting democracy over economism does, I hope and believe, offer opportunities for a way forward.Moreover, a practical demand that relies on the familiar and long-embraced concept of democracy has the advantage of allowing us to seize control of the concepts which capital requires for its hegemony and turning them against that hegemony in a way that "alien", suspect"and "failed" concepts like "socialism" cannot. The right in the English-speaking world has, I regret to acknowledge, largely managed to turn "socialism" into an epithet and, while I also believe in reclaiming it, we also need a broader, more popular vocabulary if we hope to reach out beyond our own embattled, die-hard circles. We have to choose; do we want to die as withered dinosaurs insisting on waving our discredited symbols on the margins of society as the world passes us by or do we want to try to take the essence of our beliefs and reembody them in new, more relevant forms that reaches out to groups we may never have been able to appeal to otherwise? I would, personally, prefer to take the latter path. "...simply advancing absolutist anti-capitalist slogans or platforms..."
"...embattled, die-hard circles...withered dinosaurs...waving discredited symbols on the margins etc etc etc"
"...simply advancing compromised crypto-capitalist canards." "...ignored, hobbyist circles...withered preachers...waving discredited platitudes in front of cliques etc etc etc". Socialism is not a failed concept because it is the negation of failing capitalism. The form of socialism depends on the desires and experiences of society, once they have been stripped of all their past high standards and of their future prospects - as in Spain, Greece and backwater USA. If you want to include capitalism in your mixed economy, you cannot also apply the adjective "democratic". Left capitalism is the problem, not the solution. I'd agree that we need to be careful - because on the Right also there will be those who accuse us of being 'out of touch' etc with regard our concepts and language. This could have the effect of new activists 'giving Marxism a wide berth' - as a consequence of such perceptions; and hence never grasping the crucial insights of the broad Marxist tradition. Key Marxian concepts such as class struggle, overproduction, cyclical crises/destruction of capital, the tendency towards monopoly, ever intensifying exploitation - are as relevant as they ever were. On the Left we should not abandon such substance for the sake of intellectual fashion or short-term acceptability. But we have to appeal to and mobilise the Centre-Left as well. And we need to combine long term cultural strategies with the other imperative of building and maintaining a broad left electoral bloc. There are spaces where we can maintain Marxist insights that they may rise again to prominence in the future. And we can promote dialogue between the Left and Centre Left with the aim of transmitting more radical insights to 'the mainstream'. Over the long term the balance of forces may change. But for now the broad left (Left and Centre Left) need a discourse which can mobilize activists, and mobilise electoral blocs. The "Democratic Mixed Economy" can do that. And by bringing the matter of economic democracy into the mainstream - it can shift the broader Left in the direction of a critique of capitalism and plutocracy. Chris also raises the important issue of 'Socialism versus Left Capitalism'. There are many facets of this question. Firstly - is socialism only the complete negation of capitalism in practice - or is it the movement to overcome capitalist contradictions and injustices? Secondly - what are the prospects of overcoming capitalism completely in the foreseeable future? If the full negation of capitalism is currently impossible - but a movement against capitalist injustice is possible - and results in a democratic mixed economy - do we reject that as 'Left capitalism'? Assuming a global economy - overwhelmingly capitalist - with a dependence upon multi-national corporations - and the necessity of specialising in certain areas in the global division of labour - then we 'cannot go it alone'. But what if we *could* progressively and incrementally nationalise mining, oil, transport and communications infrastructure; socialise areas of banking/finance; fight off the movement to privatise higher education; radically expand the welfare state and social wage - and progressively reform the tax framework? What if we could achieve co-determination (as limited as that is) even in the operations of the foreign multinationals? What if we could achieve a degree of socialisation of the economy via public pension funds - maybe even democratic citizens' funds in some ways similar to Meidner - and at the same time take away the element of risk present in superannuation? And what if we could have state subsidy and cheap loans for co-operative and mutualist enterprise - with the consequence of co-operative and mutualist enterprise getting a solid foothold in the economy? Further: What if we could reduce the working week rather than extend it - and also *bring down* the age of retirement - made viable via higher taxation to maintain infrastructure, social services and welfare? And finally: what if we could do this in the context of an agenda of education for active and critical citizenship which had the effect of mobilising people over the long term to take ownership and control of democracy? This is just one scenario based on one possible interpretation of a democratic mixed economy. But the term can just as easily refer to a more thorough negation of capitalism - or a more moderate interpretation of 'democratic mixed economy'. It is intended as a 'conceptual field' providing a framework for debate, engagement and mobilization on the Left. The extent to which it is democratic is the extent to which social and democratic control is extended over the economy via socialisation and democratic forms such as co-operatives, mutualism, public ownership, democratic collective capital formation, institutionalized co-determination etc. That we are still dealing with a framework involving massive multinational corporations and the power that they wield is indeed problematic. But we have to deal with what is possible in the present. Though the variant I envisage cannot avoid anti-democratic elements - at least for a good time - it is nonetheless a movement in the direction of economic democracy. For that reason the term 'democratic mixed economy' remains important and appropriate. BTW Chris - If you're interested in writing an article to contribute to the ongoing debate we have here I'd be glad to look at it. I'm not sure you entirely get what I'm trying to argue for (in fact I get this a lot which may be due to the subtlety of the analysis, my incompetence in explaining it, or both) but the argument I am advancing is absolutely NOT an iteration of Left capitalism- indeed, my whole point in trying to do any of this is to try to negate the hopelessness and dead-end cynicism of the useless "Left capitalism" which is now the standard discourse on the centre-left but- and I think it is crucial to stress this- being anti-capitalist these days implies a long "war of position" (to quote Gramsci). My experience of the far Left (and I have spent more than half of my 40 years of life in such groups all around the world)is that they are great on critique but lousy on feasible, programmatic alternatives. The Centre-Left however (with which I am currently deeply involved) lacks the vision and theoretical grounding to get past its own weaknesses. What I am proposing is that the real history of capitalism and socialism is better described by Polanyi than Marx and that, by adopting the more hopeful analysis this potentially offers, we have a much better set of theoretical tools with which to fight capitalism. The truth is though that "fighting capitalism" (which was Polanyi's credo as much as Marx') cannot be done through rhetoric or ideological purity or even protest, it requires a commitment to "revolutionary reformism" if you like. We can hate capitalism all we like but, realistically, we are going to have to take it on in stages- first curb it, then tame it, then neuter it and finally, hopefully, abolish it. At the moment, wth the crippling lack of institutions and mechanisms duplicating those that were first built by the nation state, we lack the tools for any meaningful political fightback. The Left has been reduced to a wheezing invalid and we have to work on getting strong enough to be able to even throw a few punches at capital let alone tossing it out of the ring. If I seem "pessimistic" or too "realistic" it's only because I know the situation all too well. I currently coordinate the Party of European Socialists in Istanbul as a member of the French Socialist Party, German Social Democrats and Irish Labour and I'm also a paid-up member of the Australian ALP. Until 3 years ago however, I was registered to the Party of the European Left and working mainly with the French Communists, die Linke in Germany, Synaspismos in Greece and the Turkish ÖDP. I have also belonged, at various times, to the Communist Party of Australia (defunct in 1989), the International Socialist Organisation, the Democratic Socialist Party (both in Australia), the Israeli Mapam/Meretz party and, briefly, the Israeli Communist Party Hadash. I've seen an awful lot of the inside of the Left and lived in a lot of places and my current politics largely reflect what I believe is possible and feasible at this point in history. Obviously I could be wrong and I would be more than happy to witness the successful rebirth of socialism around the world but, honestly, I think it is going to take time- time we don't have- and I would prefer to work on what we can do to lay the foundation for something better to evolve in the future. We both seem to agree there is no 'transcending the market' in a general sense as markets are necessary for flexible determination of personal needs structures via consumption. Yet which areas specifically should markets 'not go', and what should they be replaced with? But assuming a 'democratic mixed economy', which sectors do we target for nationalisation? ; In which sectors do we encourage co-operativism and mutualism? (and how? ); What other mechanisms do we use? (eg: pension funds, wage-earner funds, citizens funds) And if we have any form of collective capital formation how do we deal with 'the exploitation of workers by workers'? (ie: in this framework is it possible to fully transcend capitalism?) Assuming ongoing integration with the global economy - how do we deal with the international division of labour - including the position of the multinationals? What is our stance on foreign investment? And what safeguards do we have against all power being centralised under a 'total state'? Secondly: Well might we give up on the idea of a vanguard party made up only of professional revolutionaries, and aiming for the insurrectionary seizure of power. But I think there is still a role for Left parties bringing class consciousness and social democratic consciousness to the people. As well as providing leadership and impetus for social movements. A mass party, yes. But a mass party which *encourages* activism. Looking at the ALP in in Australia the mass labour party model is also in crisis as all power has gradually shifted to the party organisation/trade union elites and the parliamentarians. (I say this as one who is in favour of union affiliation - but with greater rank and file participation) How do we respond to all this? Finally: How do we define 'revolutionary reformism'? If revolution is interpreted as qualitative change, what specific changes/reforms have to accumulate to the point where 'quantity becomes quality'? For instance - do we aim for the abolition of wage labour; or would we suppose 'revolutionary reforms' to have accumulated at the point where popular political and economic power was greater than that of the capitalist class? And how do 'revolutionary reforms' accumulate at the level of the *political* revolution? BTW - another problem is how to ensure co-ops and mutual associations remain competitive when they are competing against private enterprise with greater economies of scale, and which can draw new investment *from outside themselves*. (ie: the problem being that co-ops cannot draw in new investment from outside themselves without compromising the co-operative form) Any ideas? These are some very crucial questions Tristan and I'll do my best to answer systematically. Of course, when talking about these issues I can only mention my preferences with regard to strategy, we are a very long way from yet being able to contemplate any practical realisation of even our most basic dreams given the existing state of the Left. That said, we need to have some kind of vision to build on. Firstly, the question of market society. A true "market society" is, in reality a fantasy that cannot truly ever exist, in which virtually all interactions involve some element of transaction and the "self-regulating" market is the principle of social organisation. Although this idea of an economy "disembedded" from society, morality, values and even politics is extreme and unrealiseable, the mutant version we know as modern capitalism is pretty much everywhere and does a lot of damage- as we can all see pretty clearly. Now, regarding the labour theory of value, that's a pretty tough formula to apply these days. Exploitation is certainly built into capitalism but one of the increasingly obvious problems is that labour is only one of (and not even always the most crucial) variable costs involved in production. To some extent, this theory remains applicable to manufacturing but, even here, mechanisation and the application of economies of scale make it difficult to meaningfully insist on the labour theory of value. It seems more an item of Marxist (and classical liberal) faith than an easily demonstrable fact. These days, the expansiio of finance capital and speculation has made rent and interest the two major sources of wealth rather than any "real" production. An awful lot of what we call "the economy" is now really just an elaborate game of monopoly played by the rich while the rest of us just get traded around like pawns. In this sense, probably two-thirds of the economic activity carried out in the world today is pretty much useless and we'd all be better off if it simply didn't exist. This is actually a fairly crucial point to bear in mind that also has a lot to do with why labour has lost so much influence over the past 30 years. After the Second World War when rebuilding production was the first task of the economy and democratic legitimacy was a major concern of the powerful, capitalism was amenable to incursions by the "reasonable" demands of the working-class. The result was a "social-market economy" in which markets were somewhat subordinate to politics and popular demands for de-commodification. However, since the late 1970's, there has been a "labour surplus" in the developed world (largely deliberately engineered to break the post-war consensus and balance of class-forces)that was accompanied by de-industrialisation and the shift to a post-industrial economy. The interest in keeping wages low through "disciplinary" mechanisms such as unemployment and reduced workers' rights has more to do with controlling interest rates and inflation than a direct link to any labour theory of value. At least, that would be my take on the issue. As for which sectors should be de-commodified; For a start, I would argue that health and education should be de-commodified and supplied free by the state on a universal basis. I am also in favour of removing private providers- although not necessarily non-profits from both sectors. More controversially, I would also support the full nationalisation of key industries such as mining, all energy and raw materials production and distribution. Then I would also advocate the nationalisation of finance and banking (which I admit is extremely tricky) whilst also encouraging credit unions and savings mutuals as alternatives to savings banks for citizens. In almost every sector I would like to see cooperatives and collective enterprises encouraged and supported, where appropriate with state aid. I would also like to see a shift in agricultural policy that guarantees small farmers and cooperative agricultural enterprises a decent living while encouraging organic farming and permaculture through state aid and subsidies where necessary. State marketing boards for basic foodstuffs and fresh produce should actively organise to ensure efficient, local distribution networks that enable people to eat as locally as possible for reasonable prices. In truth, I would like to see markets mostly restricted to the delivery and distribution(not necessarily the production) of consumer goods and services and, where possible, I would also like to see cooperatives and collectives organising as the dominant vehicle for this. Realistically, there would be issues (as there are in Venezuela) of protracted struggles on the economic terrain between the existing capitalist forces organised in classic corporations and the emerging popular economic forms. A left government should, like Chavez in Venezuela, strategically support these emerging popular economic forces with whatever help it can. In practice, it would probably end up something like a civil cold-war as capital battles emergent mutualism and socialism but, at that stage, it might be easier for socialists to come out more radically on the side of socialism depending on the climate and balance of forces. As a start, encouraging the growth of popular economic organs would seem to be a good start both for spreading the right kind of democratic consciousness and for building working alternatives to big capitalist firms. Regarding the international division of labour- this is also a crucial question and one reason why socialists today find themselves stuck because the international division of labour not only makes sense economically for capitalists (cheaper costs etc) but also politically (it divides the global working-class and sets up natural geographic, linguistic and even intra-class divisions that inhibit resistance). To some extent, we're stuck with this global division for now but the answer, I believe, lies in coordinated international links and networked struggles. Workers in the post-industrial societies must coordinate with their brethren in the industrial, industrialising and poor world to support their struggles against capital at home. The long, hard battles to build worker's rights and force back capital in Latin America, India, Africa and China must be actively and unconditionally supported with international solidarity to the greatest extent possible. Although this is, perhaps, the most utopian of all goals, in the long term we need some kind of global analogue to state-formation to ensure a democratic system of global governance. As far as fear of an all-powerful state goes, the only remedy for that is, now as it ever was, an active, vigilant, conscious citizenry. That, in fact, is the precondition for everything. The history of the 20th Century was (and this is just as true today) less the struggle of labour and capital than democracy and technocracy. Technocracy has been the counterfeit of democracy all along. This is utterly obvious in the case of the former Soviet states where the party bureaucracy openly assumed the full mantle of popular sovereignty but it is obscured in the "democratic" capitalist world by the illusion of popular empowerment (which is getting ever thinner) and a much more subtle use of ideology. This is, moreover, something we will likely have to battle for a long time as most people don't even seem to question the tendency to professionalise everything and leave the key decisions up to "experts". This is even a strong tendency in socialism as the statism of classical Fabians and Stalinists is utterly amenable to the managerial mindset that is at the true heart of "really-existing capitalism". Building a more participatory model of democracy is a major battle we need to fight within our parties and trade unions as well as in our political and state institutions, enterprises and streets. With regard to parties- we need them. People need a locus for organisation, struggle and developing a political consciousness. As you point out- the existing parties have become slick, professionalised conduits for career technocrats- as have a lot of unions. The revolutionary reform I have in mind probably has to start there. As for how we tip the scale from accummulating reforms to transforming society- I think this depends a lot on how people decide to embrace the process or not. I think there is no predictable end to this process but, most likely, at some point, we will look back and realise we've passed a landmark and that capital has declined in power while democracy has risen. No doubt, we will also debate that point when the time comes. In the 1950's Tony Crosland argued that the post-war British order had already transcended capitalism and was now becoming democratic socialism. Few on the Left agreed and, in hindsight, he was clearly wrong but I expect we will see similar debates in future. Finally, how to stop coops failing- that's a tough one. My first suggestion (which I confess, is highly problematic) is state encouragement and subsidies combined with discrimination against capitalist firms although I can see that backfiring horribly in the real world. Actually, this is a question worth giving some serious thought to- I admit I haven't thought it through enough but real examples of coops show the dangers of this market pressure on their principles quite clearly-I'm not sure there's any easy answer. I hope this at least gives us a platform to continue the debate. Shayn, I have mixed thoughts on the labour theory of value; I don't think we should measure all labour as being of equal value. Diligence, skill, productivity - need to be taken into account - as should other variables such as how unpleasant the work is. "Unskilled" jobs are often unpleasant - and while it is common to suppose skilled labour is more valuable (it *does* command a higher price in the labour market) - in fact there is an argument that unpleasant labour should be valued more - as it requires a greater personal sacrifice. We could (and should) apply the same principles to casual work, overtime and penalty rates more broadly. On the other hand I would agree that use values and exchange values stem from nature and labour. And I would insist that Marx was right in pointing to surplus extraction as the 'secret' of capitalism. Capitalists do effectively need to leave some labour as 'unpaid' in the course of extracting a surplus. Again, though, the *precise* amount of surplus extraction is impossible to measure. Some small investors probably do deserve a return as deferred gratification is a real sacrifice for them. And sometimes the extent of exploitation hinges not only on the amount of the surplus, but can also relate to under-payment or over-payment - which can only be measured subjectively. But the *mechanism* of surplus value extraction remains even if the *degree* of exploitation cannot be measured objectively. So exploitation exists both at the level of underpayment as well as the level of surplus extraction. BTW Shayn; We seem to be agreed on the kind of democratic mixed economy we'd like to see; but also agreed that the international division of labour provides an obstacle - to which there is 'no easy way out' - because the economies of scale are truly global now. "Networked struggles" - which you mention - and perhaps a new or reinvigorated International could be part of the answer. My personal view, though, is that we should always have a free debate about the values undermining economy and society. And we shouldn't use technocratic discourse to shut down debate, here - especially where both interests and values are concerned. So here I think you are spot on - that technocracy is the enemy of democracy - as it removes democratic discourse on values and interests out of equation - ie: it guts democracy itself. re: Co-ops and mutual associations I think the only way to 'get away' with the kind of policy I prefer in the current environment would be to put a 'cap' on co-operative subsidies - in the form of cheap loans, advice and tax concessions. In the current environment I would estimate we might get away with establishing subsidised co-ops somewhere in the vicinity of 5 to 10 per cent of the market. (Probably 5 per cent is more realistic given the cost and the anticipated resistance) Future re-mobilization on the Left and by sympathetic social movements may allow us to be more ambitious. In Sweden wage earner funds (a different form of economy democracy) were originally very ambitious - but were eventually whittled down to 20% of the stock exchange. (and thereafter dissolved entirely) Assuming a re-mobilised labour movement - and acknowledging the Swedish precedent - we might then aim for Citizens Investment Funds perhaps up to a cap of 10 per cent of the stock exchange. We need to talk about economic democracy and get it back onto the 'radar' of the labour movement and progressive intelligentsia. These measures re: co-ops and collective capital formation - alongside a gradual re-extension of the public sector and social wage - are probably the best we can aspire to for now. But a more strongly mobilised labour movement - and other allied social movements - could 'change everything' - and open the way to more ambitious agendas. But how to achieve this when the trend is demobilisation, demoralisation etc? Sourcing of new investment for co-op and mutualist enterprise could provide a real obstacle. One answer to the dilemma of sourcing new investment from without co-operative or mutualist enterprise - could be joint ventures with government - hybrid public/co-op enterprises. But even here the logic of such arrangements could reach the critical point of ceasing to be a mostly-co-operative or mutualist enterprise. Where there is a relatively large but not ever-expanding local market - eg: domestic banking - the need for ever-growing economies of scale might not be such a problem after all, though. Regarding the "labour theory of value", I feel we can fairly safely dispense with, at least, its classical form to all practical purposes. As for calculating remuneration; if we were to imagine a fairer economic order, I would definitely agree that payment for duller, less emotionally-rewarding and onerous jobs ought to be higher than for pleasant, fulfilling ones. Ideally, the really miserable jobs should be cleaned up, mechanised or eliminated but not forced on the poor and desperate as currently occurs in a market society. We need a welfare order that innoculates against the "work or starve" values of the neo-liberals. The economy has to be for people, not the other way around. "Marketism" is like some freakish Biblical exercise in idolatry-shades of Moloch worship! Still, this remedy I am assenting to here is more based on a moral scale of remuneration than any real sense of "objective value". Ideally, I'm all for the communist formula "from each according to..."you know how it goes. If I had my way, I'd pump for Michael Albert's ParEcon and toss the market altogether but, sadly, I think that's just too ambitious for the moment. We really are stuck with certain features of the way things currently are, at least until things have changed a hell of a lot from how they are now. Regarding technocracy, to some extent you are right that "Left" and "Right" technocracies are different. The approach of Soviet technocrats and those of corporate/state technocrats in Washington or Brussels proceed from a totally different set of assumptions and goals yet they are both ultimately oppressive and anti-democratic. I wouldn't agree either, that technocracy is merely a symptom of capitalism but rather of complex machine-based societies whether capitalist, corporatist or state-socialist (and many societies are really a mix of these elements). In fact, post-industrialism and the end of the machine order, I would argue, offers our best shot and transcending these kinds of "mechanical" hierarchies. Manuel Castells' "The Network Society" has a lot that is overstated and worthy of criticism but I think he was onto the potential embedded in the post-industrial, digital era. Every modern age and social model to some extent could be said to contain its own dialectically embedded potentials for oppressive hierarchies and also their democratic remedies whether or not they are realised. Although it is easy to overstate, the Hardt/Negri "Multitudes" thesis also represents a critical variant of this view. The broad outlines of the future would appear to lie truly in much more horizontal networks. I would like to believe that capitalism is undergoing its "perestroika moment" the turning point that signposted the beginning of the end for the Soviet model as attempts were made to reform what was unreformable. We do not have a ready-made alternative to "defect" to the way the former socialist states were simply sucked into neo-liberalism, so we have no choice but to pursue the difficult task of building on unknown territory. Capitalism is doomed but struggling to stave off the inevitable. I believe many aspects of what we associate with "capitalism" may possibly survive this collapse- just as elements of Sovietism linger on in Russia (mostly the least progressive elements) and we need to figure on how best to act as a "reluctant transition" is forced on us by the demands of unworkable circumstances. Based on history, the biggest danger is a more nakedly technocratic, even totalitarian solution and, this, although we may not see it clearly now, is a threat to take seriously (without getting hysterical or panicking). I feel we're cooking up good, general ideas here about the way forward (and, I'm pleased to report, the same ideas are popping up all through the Left parties in Europe) but the Left parties are trapped in a vice at least partially of their own making and I think we really need to work hard on finding the way out. I can already see from the direction in the French Socialist Party leading up to our Toulouse conference that we are maddeningly stuck on the idea of "caution". All the markets need to do is say "boo" and our brave socialist leaders back down cap-in-hand. They want to talk Left but stammer over the words and blush for shame when reprimanded by the "wealth generators" of business. Shayn; I'm just about to publish a new article tomorrow (Sunday); and I think we're losing readers for our exchange at this point - because the vast majority of readers will already have gone through the original article. But maybe we can explore the themes we've been discussing here in more detail with new articles? For tomorrow I have an article an the Sole Parents Pension in Australia; After that I'm thinking of writing something myself on the decline of tax revenues, the infrastructure crisis and the response of federal and state governments here in Australia. After that I was thinking of publishing one of Eric's articles on the finance sector. So - in about 6 weeks I'll probably need more material. I'm afraid I don't know much about Castells and Hardt/Negri... I have 'The Network Society' but never got around to reading it. Re: Perestroika - I felt the system had the potential to be reformed if Gorbachev had enjoyed more time to do so. What occurred after the counter-revolution took hold was the rise of the oligarchs -'out of nothing'. The means of production which had been built up by the Russian workers over 70 years was simply 'handed over' to a new elite. How could such a process be viewed as legitimate? It was based upon pure power relations. Instead of stacking the privatisation process and giving rise to the oligarchs, though, a democratic mixed economy could have been phased in with the creation of co-operatives based on non-trade-able and equal shares. Perhaps in some cases as joint-ventures with the State. Markets would have become much widespread - but in the context of economic democracy. Yet the Soviet people - rendered submissive by decades of repression - were in no mind to resist; There was no strong and independent civil society to resist the whole corrupt process of privatization. But I'm not aware of the minute detail of how far privatization went in Russia. My impression is that a political elite rules, largely via the co-option of the financial 'oligarchs': and those who do not full in line are smashed by the state. Re: *Capitalism* having a 'Perestroika moment' Your fear of a "nakedly technocratic" or "totalitarian" 'solution' is a fear I take very seriously. What policies do you think social democratic governments should embrace in response to the current crisis? Maybe another article could be based on the theme of a 'road-map' in response to the current crisis for international social democracy and its allies?